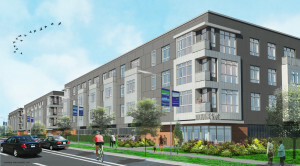 The first of the month saw the news that DuCharme Place, a $42 million, 185-apartment unit development across from Lafayette Park, will begin construction June 11. News about the development had been quiet ever since we first reported it in July 2014, but it appears things are back on track after missing an original groundbreaking target date last fall. McIntosh Poris Associates and long-time developer Walter Cohen have been working on the DuCharme Place development since 2004. That development team is also responsible for the Foundation Hotel, a boutique hotel planned for the old Detroit Fire Department Headquarters downtown. In an article detailing the recent boom in Detroit hotel development, the Free Press reports that the Foundation Hotel could begin construction within 90 days. The possible Wurlitzer Building redevelopment is also mentioned.